On behalf of spayed and neutered pets everywhere, I say God bless Bob Barker. I have tears streaming down my face right now watching this tribute thing on CBS tonight. He just talked all about being anti-fur, and now Adam Sandler's out there on stage with him... God, what a legend. 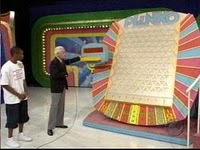 I've always wanted to go on The Price is Right; I can't believe I never did. I mean, I never even tried, which is so pathetic. That's a lesson I guess—take full advantage of today's opportunities because they might not be around tomorrow.